Newly appointed Eastern province Minister Charles Banda has called for discipline and hard work from PF party cadres and government workers in the area. Mr Banda took a swipe at party cadres in Chadiza who locked out the newly appointed District Commissioner Paul Phiri adding that he will not tolerate that kind of indiscipline. Mr Banda said the action of locking out the District Commissioner was tantamount to insulting President Sata who is the appointing authority. ZANIS reports Mr Banda was speaking in his office this week upon taking over the office from Solomon Mbuzi who has been deployed to the foreign service. The Provincial Minister said the party had structures in which cadres can air their grievances as opposed to exhibiting such indiscipline. He challenged party cadres who are not happy with the president and party’s actions to resign before their hounded out of the party. He said party cadres and civil servants should work hard to develop Eastern province adding that unity was paramount to achieve the goal. And outgoing Provincial Minister Solomon Mbuzi called on all government and party officials to give the new minister the support. Mr Mbuzi said he will be available for advice from time to time should Mr Banda need it. Meanwhile Mr Banda was received to a rousing welcome by a mob of cyclists and some taxi drivers who escorted him from Lundazi turn off to his office. bootilicker of satas shoes.give us jobs than yapping yapping all the times. sha!! upnd cadre jst shut up your time ‘may’ come but for now swallow the bitter pill. 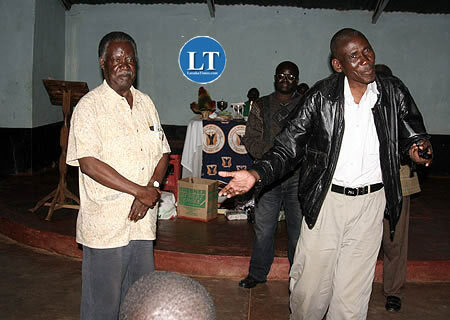 sata is President of Zambia! how refreshing……….. Wise advise Mr Banda, this is what we call politics unlike what we used to happen during MMD era. Cadres must be disciplined. Kuyelekedwa Juju, Akapanga matama kumutidzimula kumene ameneyo. Am I the only Easterner who is vehemently opposed to the creation of Muchinga and stealing of Chama. Easterners for once please be like the southerners and westerners; you claim wisdom came from the east protest as well. I know the bible says be meek but being meek does not mean nkalani opwalala! Viva Zambia viva nine provinces. imwe..why send ba Solomon Mbuzi for foreign mission..he will come back as cargo..he should have stayed home..Mr.Kapoche you are not advising your president..
chalesi Banda has been rewarded for stealing from ZNBC. This PF GOVERNMENT is rewarding crimiunals and thieives such as Chungu , Emmanuel Mwamba, and chalesi Banda. Where is the fight against corruption ba cycle mata. It appears the job of the president in PF govt is only to fire people and replace them with thieves on a daily basis. What develoment do you expect? Already it seems the PF campaign promise of intriducing homosexuality is bearing FRUITS WITH THE coming of Ban. The pesient is silent because that was his initial campaign meessage. Teti tu dabwe bane. We only afraid. # 4 Kwekwe. Its PF cadres locking out a PF DC in Chadiza. MMD cadres never ever locked out an MMD DC. PF cadres are frustrated by their own party and as their ‘Don’t Kubeba’ badge implies lawlessness is what is prevalent with party. # 9 Mwanawakwitu. Eastern division by who ever attempts it will yield to zero since Luangwa up to Chama constitutes eastern province. Easterners were not consulted and we do not take notice of unconstitutional, unilateral decisions by individuals. Be at peace Eastern province is not affected and if some one took part of it you would have been told. No. 9 Mwanawakwithu- What benefit is it going to make? The same chiefs same every thing. Chama was far from Chipata. Let those dull and unwise chaps in Southern continue doing those marubbish. Don’t start encouraging wise people to start unwise things.